Allow me to give you a phase-by-phase summary of how it’s gone so far. Since the Board’s requirements necessitated a single download link, it was made a requirement that http://spins.fedoraproject.org was designed, created, and complete before http://get.fedoraproject.org was changed, to address concerns posed by Fedora spins owners. The site was meant to alleviate the effects on spins’ download numbers, and also to maintain and even improve the ease with which spins’ users could find information and downloads for the spins. 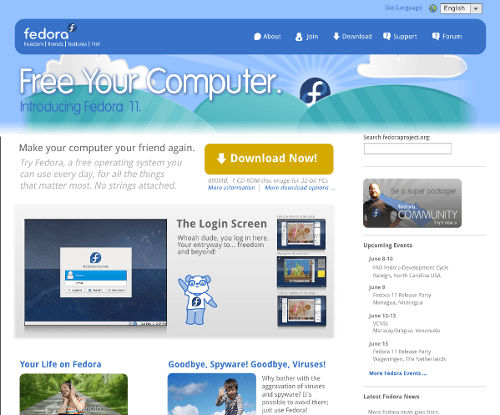 The new Fedora spins portal was completed in November 2009 and launched with the release of Fedora 12. The mockups, graphic sources, and other planning documents for the spins.fedoraproject.org / phase 1 of the website redesign project are available on the Fedora Project wiki: https://fedoraproject.org/wiki/Website_redesign_2009/Mockups/Spins.fpo. We worked very carefully with the spins owners at the time to develop graphics and content for the spins, and even coordinated an awesome effort from the Fedora Design team in producing over 100 graphics for many of the games in our Games spin. How well did this design work? So far, we’ve updated it once to account for the new crop of spins released with Fedora 13 (including the new Design Suite, wee!! ), and I really haven’t heard any negative feedback about it besides folks simply not knowing about it. So we probably need to continue advertising it and socializing it, maybe even ramping those efforts up a bit more. Now, if you know the Fedora users I do, the main tension here should have jumped off your screen and nipped you in the nose by now – we have folks who are particular about the desktop they run, the arches they need to run it on, the format in which they’d like it (live media vs. DVD vs. initrd vs. net boot vs. preupgrade vs. pxe vs. ad nauseum 😉 ), and the download method (http, ftp, bittorrent, postal mail paid, postal mail free media, etc. etc.). This is a very complex matrix, and directly conflicts with having a simple one-click download. In order to figure out how to make this all happen and succeed, we had our work ahead of us. First, I did a little bit of research on how folks currently in the community download Fedora, running a survey on our planet. Note the survey doesn’t include any new users. 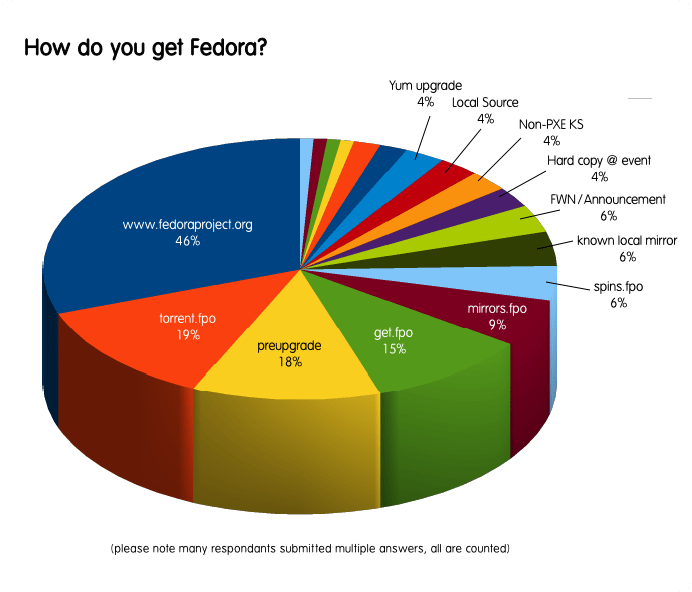 Amongst readers of this blog, the vast majority of users download Fedora when a new release comes out. The time between releases can be considered a much lower-traffic time period for downloads. By far, the most popular method of obtaining Fedora amongst blog readers is via the website, 46+15= 61% of users downloading directly from the website. The second and third most popular methods are bit torrent and pre upgrade, 19% and 18% respectively. 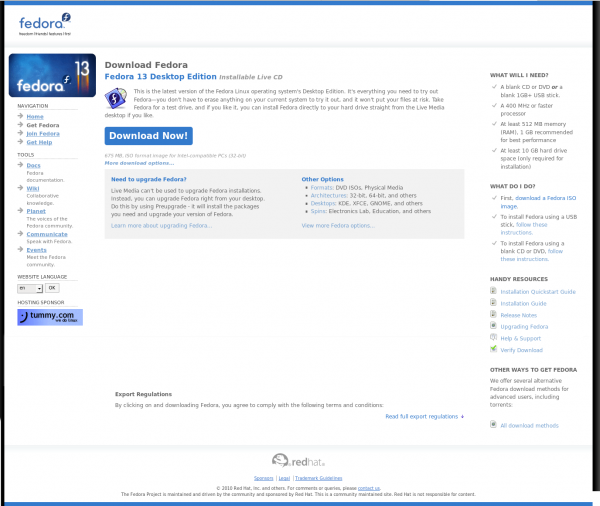 The DVD and Live Media are by far the most popular formats to download Fedora in amongst readers of this blog. The first section would be presented by default, and would be aimed at fulfilling the Board’s requirements. The second section would be accessible by links on the default page, and would provide an ala carte experience for more particular Fedora downloaders. 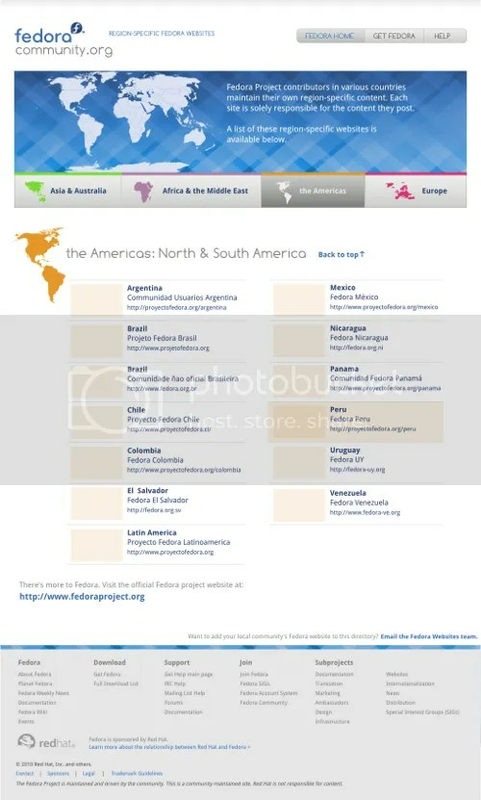 Site maps, mockups, graphics, sources, and discussion can all be found at the wiki project page for the http://get.fedoraproject.org redesign project. 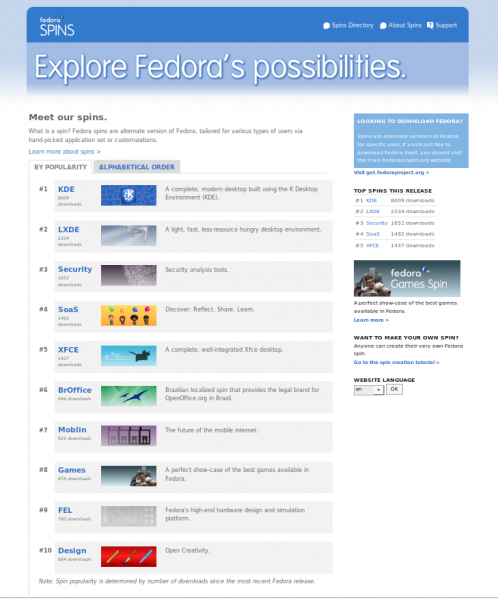 So for Fedora 14’s release we’ve gotten even more ambitious, and we’re planning a new http://www.fedoraproject.org design and a new site, http://fedoracommunity.org. Here on this blog I’ve already filled you in on the fedoracommunity.org site background and current design work(thank you for all the comments and feedback so far!) I’m still working on the http://www.fedoraproject.org design with Sijis Aviles and the Fedora Design team – we had a big discussion on it at this week’s design team meeting. Pop into #fedora-websites or #fedora-design on freenode if you’d like to pitch in and get involved as we continue to work on it. In summary, we’ve been following a 3-phase approach to the http://fedoraproject.org design process, and we’re currently working towards the third phase with our eye on F14’s release for the next launch. 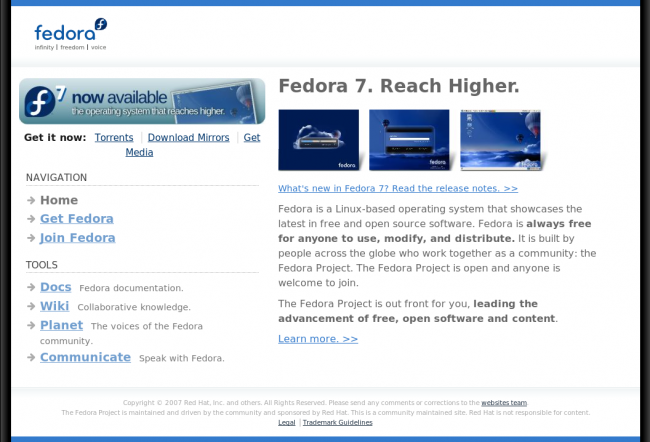 Great review on the changes of Fedora website. Thank you, Mairin. I liked them all and mainly the Fedora Community one. It seems, to me, the most “modern” and clean and clear. I have just one doubt or curiosity: what did you use to make that pizza chart? Great work you’ve been doing. I’m just an enthusiast of Fedora. I used OpenOffice.org Calc on Fedora to create the pizza chart 🙂 I’m pretty sure I used the Tango icon palette to color it with. The survey was faulty. It would be a mistake to base website design decisions on it. I download torrents but I don’t “go straight to torrent.fedoraproject.org”. Instead I go to http://www.fedoraproject.org and click around until I find the link for for torrent.